This entry was posted in Just Life on August 9, 2014 by Steve Tilford. I am kind of in a rush this morning. I hate being in a rush on a Saturday morning, or really any morning for that matter. I’m meeting the Endersbe family, Rivers Eatery propriators, and driving up to a burn area, North of Barnes, to pick blueberries. I rode up there yesterday, which btw, was a new post-op mileage record of 63+ miles, and the blueberries are pretty much everywhere. I guess that is one advantage of having a raging forest fire up in Northern Wisconsin, nature rewards with blueberries. Like I said above, I rode 3 1/2 hours yesterday and sort of fell apart on the way back. I’m wondering where all those glycogen stores go when you hurt? I really didn’t spend all that much time off the bike, not even time to bonk at 50 miles. I had to stop at a corner bar in Drummond and get a Snickers bar and Coke. It was kind of fun being in the bar later on Friday afternoon, it was good people watching, but I was mildly bummed about not being able to get the 14 miles back without stopping. I had dinner, once again, at the local hangout, the Rivers Eatery. There were lots of interesting people there. 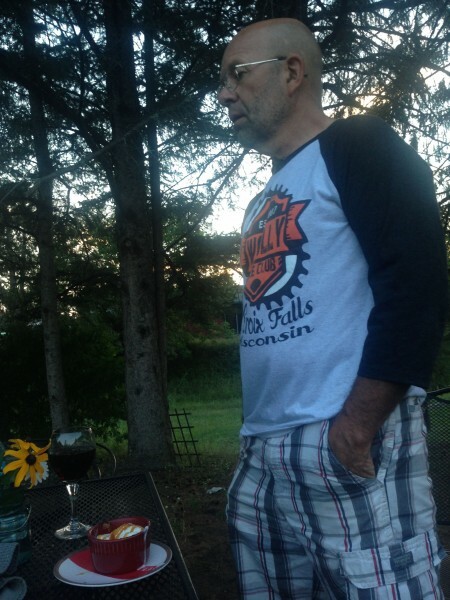 Mick introduced me to Gary Sjoquist, a super cycling advocate and just an all around energetic guy. He is one of those guys our sport needs. 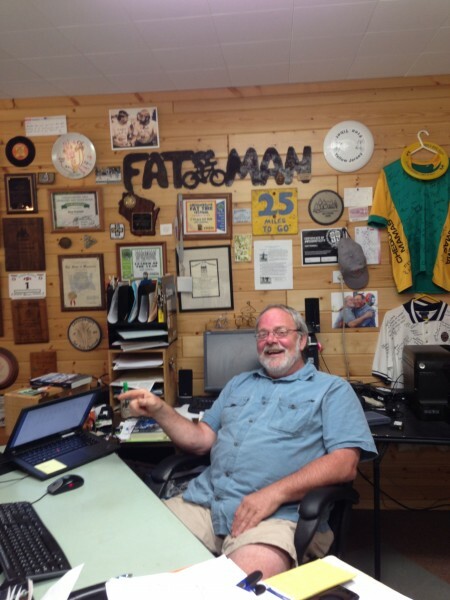 He is many involved with NICA, trying to get more young people into the sport in Minnesota, or where ever. Plus, a ton of other stuff. I’d like to meet up with him again to see if I could help him with any of his many goals. I also had the pleasure to sit down with Craig Bierly and have a glass of wine. 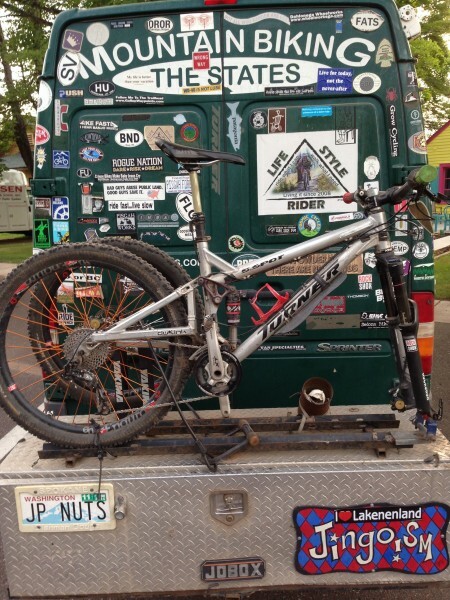 He’s been travelling all over the US for the past 7 years, riding his MTB on the best trails he can find. Here’s an interview with him to see how he got to be a MTB transient. And here’s link to his website to follow his adventures. Pretty interesting fellow that is leading a very rich life. I hate to say it, but I have to suit up for the blueberry picking. Gonna take some Avon Skin So Soft with me just in case the mosquitoes are bad. It hasn’t been too bad so far, but why take a chance. I stopped by the offices of Mr. 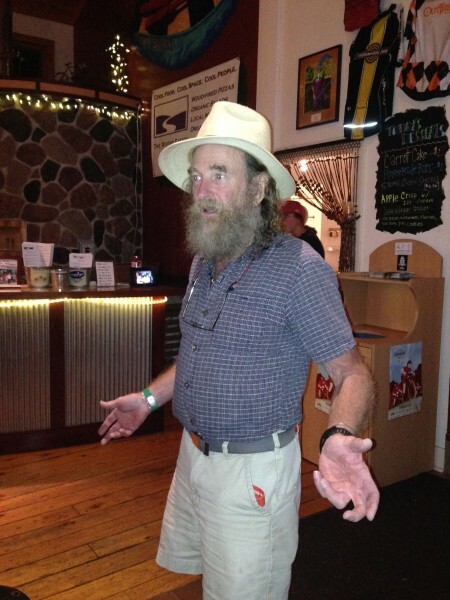 Fat Tire himself, Gary Crandall, to pay pilgrimage. 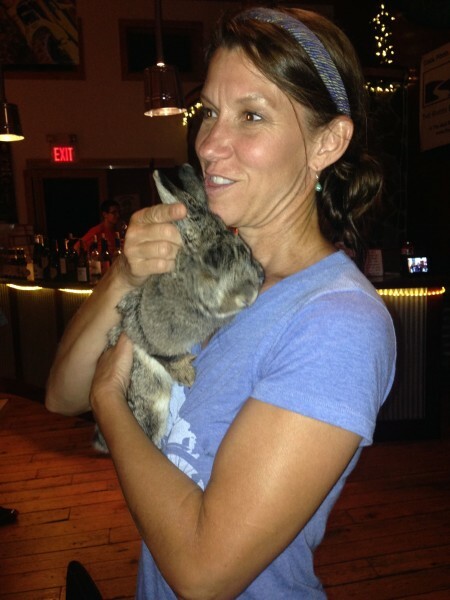 Beth and her rabbit Lucy. 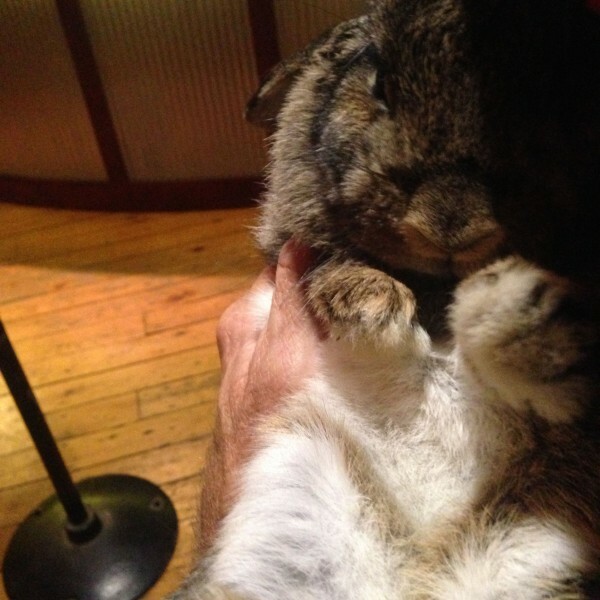 I got to hold Lucy and she is a sweetheart. Gary Sjoquist enlightening me on advocacy.